in keeping with my committment to post something everyday – i have an update to share. i completed the second of the 4 mini’s for the new small wallhanging/collection. thought i’d post the picture of it in it’s proposed location. i suppose it could change places with the (new) one in the lower left corner – we shall see. also, if you are familiar with my designs, you might notice i have done this one a little differently than i normally do. the lower half, that is the blossom, i usually make all of the pieces petals with just that tiny base being ‘green’. 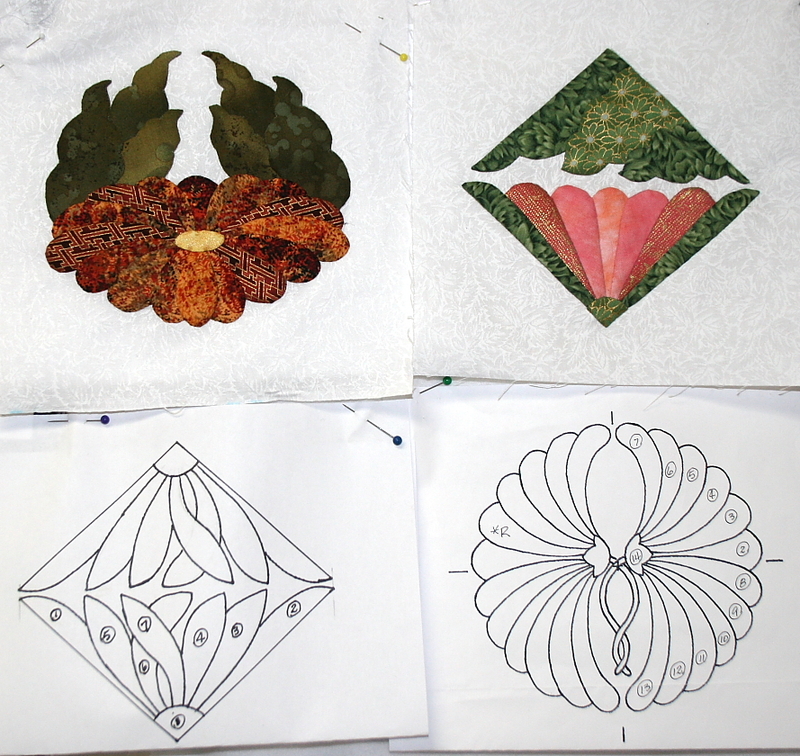 this time i chose to make the outermost pieces into the green that is the bud or covering of the petals. not sure why – just my frame of mind at the time. artistic freedom?? ^_^ i am doing the same thing with the design in the lower left space – which is new and has no precedent. as always – if you do either of these – you get to choose how. well, i’m happy to see that things have returned to normal for me here and i was able to space on past the picture and type here. ^_^ gremlins!! oh, if you haven’t visited the webpage in awhile (or ever) – i have added a second page to the free tips you can get for merely inputting your email address. it’s words that will eventually go with pictures in a book i am working on – my attempt to write ‘how to applique’ – or more accurately, how to make invisible stitches in applique. let me know what you think. will be better with pictures, but even if i had them, not an option for that application.